Though the recipe calls for black raspberries, you can sub other berries, such as blackberries or red raspberries, in this rich Italian-style ice cream. Allow egg yolks to stand at room temperature for 30 minutes. In a large mixing bowl, beat egg yolks with an electric mixer on high speed for 5 minutes or until thick and lemon colored. Gradually add the 3/4 cup sugar, beating until well combined. Transfer egg mixture and lime zest to a large saucepan. Add half-and-half and whipping cream. Cook and stir over medium heat for 8 to 10 minutes or until mixture reaches about 180 degrees and thickens slightly to coat the back of a metal spoon. (To test, dip a metal spoon into the custard and draw a line with your finger through the coating. The custard is done when the edges along the line keep their shape.) Remove from heat. Pour custard through a fine-mesh sieve into a large bowl to remove lime zest. Place bowl in a very large bowl or sink half full of ice water. Stir to cool the custard; set aside. In a medium saucepan, combine 3 cups black raspberries, 1/2 cup sugar, the peach preserves and salt. Bring to boiling over medium heat, mashing berries with a potato masher or wooden spoon; reduce heat. Simmer, uncovered, for 5 minutes, stirring frequently. Remove from heat; cool slightly. Transfer berry mixture to a food processor or blender. Cover and process or blend until almost smooth. Pour mixture through a fine mesh sieve into a medium bowl, pressing on solids with back of a spoon; discard solids. Stir mixture into custard. Transfer the custard mixture to a bowl or other container. Cover surface with plastic wrap; chill 8 to 24 hours. Transfer to a 4- or 5-quart ice cream freezer. Freeze according to manufacturer's directions. Spoon into freezer container with tight-fitting lid. 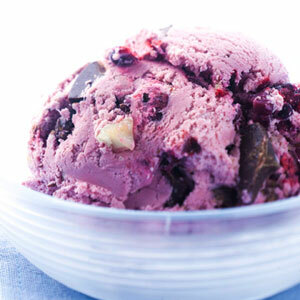 Using a sturdy rubber spatula, fold in 11/2 cups chopped black raspberries, the chocolate and nuts until just swirled. Cover and freeze for 4 hours to ripen.